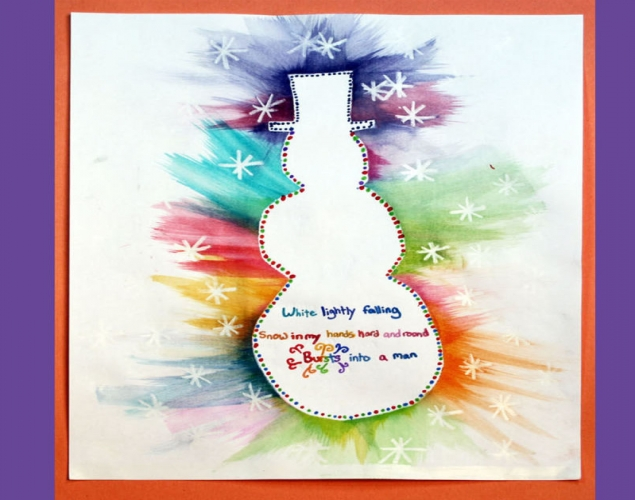 Students create decorated writing paper by making a stencil print using crayon, marker with water and an overhead transparency. 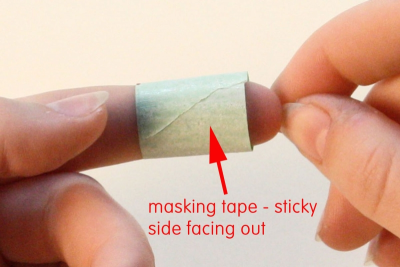 Roll a piece of masking tape with the sticky side facing out to make a loop. 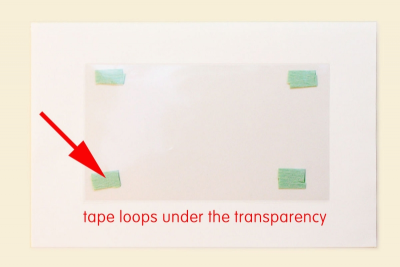 Use the loops to fasten the plastic transparency to the paper. Make sure the tape is under the transparency. 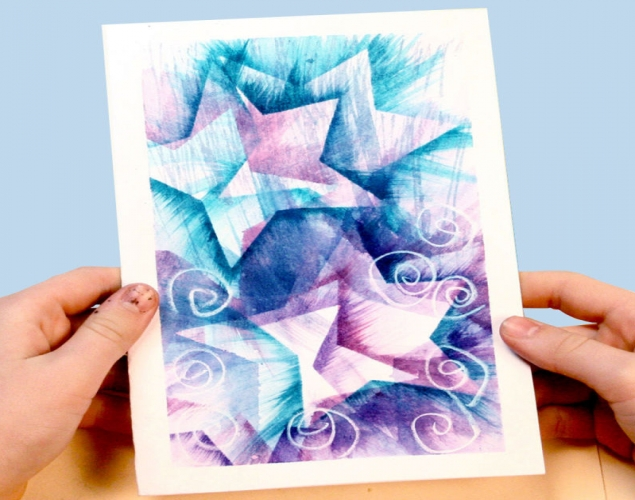 Use crayons to colour a scene or design on the outside edges of the paper. Press hard with the crayon. 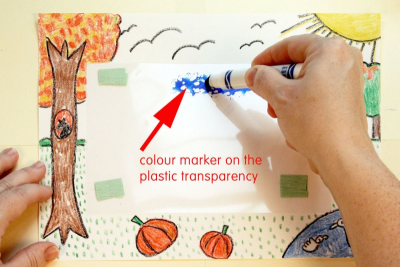 Colour a patch of marker ink on the edge of the plastic transparency. Make sure the ink stays on the transparency. Dip a small piece of sponge into the water. Squeeze some of the water out of the sponge. 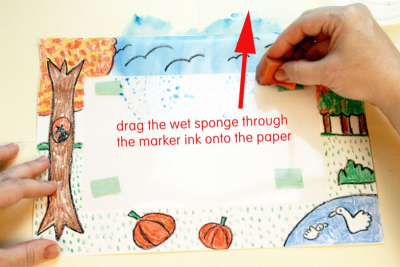 Drag the wet sponge over the marker ink and onto the crayon design. Continue in this way until the outer frame is complete. You have made a stencil print. 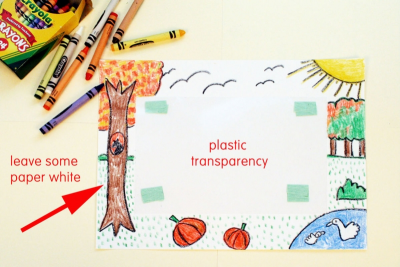 Gently remove the plastic transparency from the paper. Use a ruler to measure and mark 1 cm spaces down both ends of the blank shape. Use a fine line marker to connect the marks with lines for your writing. 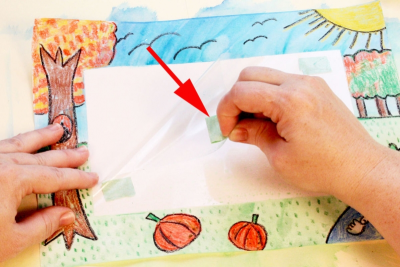 Use a marker to make a border pattern inside the blank shape. Fill your decorated page with some wonderful writing. Download the Shape and Pattern posters available on this website. Prepare materials to use for a demonstration. Prepare a completed sample page. Cut overhead transparencies (the 'write on' type) into half sheets. Gather, and make available, picture books that have interesting illustrations, including any that have text framed by illustrations. View some of the picture book illustrations drawing attention to the details in the illustrations and how they connect to the story. Show students your sample and ask them how they think it was made. Demonstrate the process for making a stencil print by first drawing with crayon on the outer edge of the paper, and then dragging marker ink over the transparency with a damp sponge and onto the paper. 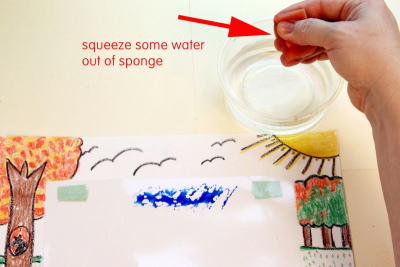 Discuss what happens when water mixes with the ink, and when it is painted over wax crayon. - Water and wax are different forms of matter. - Matter is made up of tiny molecules that are attracted to each other. - Water beads up when it is on wax - the water molecules stick together but not to the wax. - Water and wax do not mix - artists use this understanding of chemistry to make art using a technique called crayon resist. Discuss the use of shape to define a space for the written work. Focus on the purpose or theme of the writing, and what an appropriate shape would be. Introduce/review the characteristics of pattern. 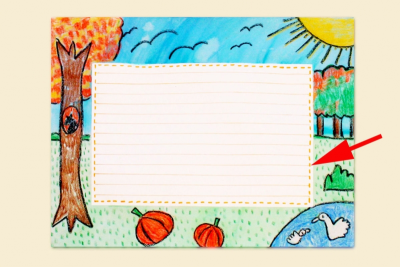 Compose a scene or design to frame a specific piece of writing. Explain how water affects wax. Demonstrate the technique as you guide students through the steps outlined in this lesson plan. - Share their papers and take turns discussing the things that are especially effective and why. - Talk about how the decorated paper will enhance the written work. - Talk about what they found difficult and what they found easy to do. Observe students as they discuss the decorated papers – active listening, insightful contributions, supporting ideas with evidence found in the artwork and from personal experience.